WILKIE COLLINS Autograph inscription in Prayer Book. British (English) novelist. Author of 'The Woman In White', 'The Moonstone', etc. 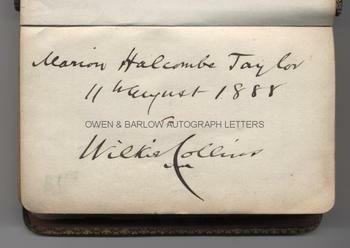 Autograph signature and inscription "Marion Halcombe Taylor, 11th August 1888, Wilkie Collins". On first blank leaf of The Book of Common Prayer and Administration of the Sacraments, published by Eyre & Spottiswoode [n.d.]. 16mo. Approx 5 x 3.25 inches. 541pp. Grained full limp morocco binding signed by the binder Loxley Brothers of Sheffield. Lettered gilt on spine an upper cover, blocked gilt with monogram, gilt dentelles, all edges gilt. Inner hinge cracked at joint. Some loss to top left corner of front paste-down. One page loose. All else VG. An interesting item as Marian Halcombe was the name of the devoted half-sister in Wilkie Collins' 'The Woman In White'. The character of Marian Halcombe has been described as one of the finest creations in all Victorian fiction. 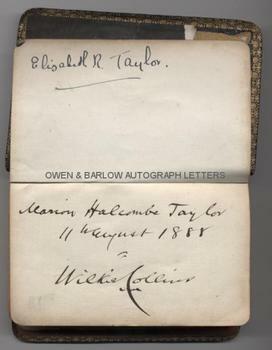 It appears that the recipient of this prayer book, Marion Halcombe Taylor, had been named after the character in 'The Woman in White' (with a minor variation in spelling) and it can be inferred that Wilkie Collins had acted as her Godfather (a prayer book being the traditional Christening gift). Marion Halcombe Taylor was born in Ecclesall in the West Riding of Yorkshire in about September 1886. She was the daughter of Benjamin John Taylor (b. ca. 1847), a horn and ivory merchant of Sheffield. 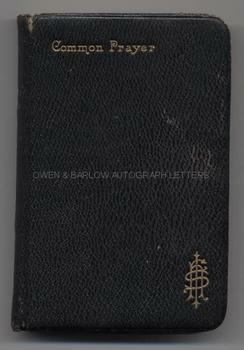 The book also bears the later ownership name of Elizabeth R. Taylor on the front free end-paper. We have not established the nature of the connection between Wilkie Collins and the Taylor family of Sheffield and this would merit some further research.